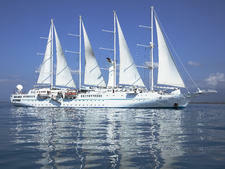 For years, Windstar Cruises had been a fleet of three majestic motor-sail yachts: Wind Surf, Wind Star and Wind Spirit. But in 2014–2015, the line doubled in size when it purchased a trio of 212-passenger luxury yachts from Seabourn. Star Legend is one of those yachts, and Windstar applied $8.5 million in upgrades to the ship before it joined the fleet. Cabins, restaurants and all public spaces benefited from the refresh. 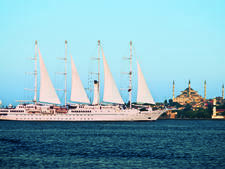 Windstar's vibe of laid-back luxury carries over from the sailing ships to the yachts. The intimacy of the ship means that the crew -- especially the stewards, wait staff and bartenders -- get to know you and anticipate your requests. The staff is friendly and will ask how you'd prefer to be addressed -- not defaulting to "Mr. or Mrs. So-and-So," as is often the case on the luxury lines. The ship's ambiance is relaxed but classy, with casual attire recommended during the day and resort casual in the evenings. The freedom of no formal night means travelers don't have to pack too much. 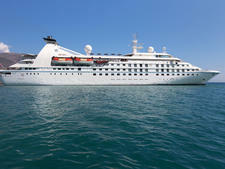 Star Legend offers an "almost luxury" experience, just like its fleetmates. Your cruise fare isn't all-inclusive like it is aboard the ships of SeaDream, Regent Seven Seas or Silversea. Nonalcoholic beverages (soda, water, specialty teas and coffee drinks) are included, but you'll need to buy a beverage package or pay a la carte for any alcoholic beverages that you order. You'll likewise pay for all shore excursions. All dining options, including the intimate Candles, are surcharge-free. Windstar's port-intensive itineraries are a major selling point to many passengers who select their voyage based on the destinations Windstar visits. Star Legend isn't the type of ship where travelers stay aboard all day when the ship is in port. They get out there and explore -- either as part of a ship-sponsored shore excursion or on their own. 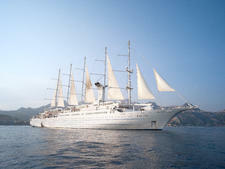 As with Windstar's sailing ships, the line's tradition of playing Vangelis' heroic "1492" theme song (from the film of the same name) extends to Star Legend -- although the crew hoists flags on Legend instead of those big beautiful sails found on Wind Surf, Wind Star and Wind Spirit. Star Legend attracts well-to-do professional couples in their 40s and 50s, as well as active retirees in their 60s and 70s who enjoy meeting fellow passengers and partaking in pastimes such as water sports from the ship's aft marina. It also appeals to older and less mobile folks who need to make use of the elevator (not found on Wind Spirit or Wind Star). The majority of passengers are American or Canadian, though you might find contingents from places like Australia and Mexico. 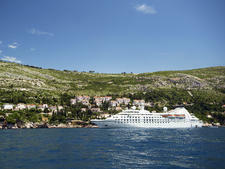 One of Windstar's hallmarks is its ability to offer luxury in a laid-back atmosphere. There is no daytime dress code: Shorts, jeans, T-shirts and capris are all fair game and underscore the overall casual vibe of the ship. In the evening, bank on "elegantly casual" attire such as sundresses, blouses and slacks for ladies, and slacks and collared shirts for men. Jeans, T-shirts, shorts and sneakers are prohibited in the restaurants at dinner. There are no formal nights on Windstar, though they do throw deck barbecues that allow shorts and more casual attire. All passengers are charged $13.50 per person, per day, for gratuities. The fee is added to your tab and can be paid at the end of the cruise via cash, traveler's check or credit card (American Express, Discover, Visa and MasterCard only). If you wish to tip more or less than the suggested amount, visit the Reception Desk. A 15 percent tip is automatically charged to all beverage orders and spa treatments at the time service is rendered. The onboard currency is the U.S. dollar.